Leaving the ship which is berthed at Mount Maunganui, we first cross the harbour bridge to Tauranga City and take the inland direct route to Rotorua. This old drovers road takes us through deep gorges, native and plantation forests and farmland, so you have great scenery to enjoy on the way. Arriving in Rotorua, we first spend time seeing the main sights of this very interesting city, such as the Government Gardens, the Bath House, Blue Baths and the Rotorua lakefront before heading to Te Puia, the home of the Maori Arts and Crafts Institute and the location of the famous Pohutu Geyser. 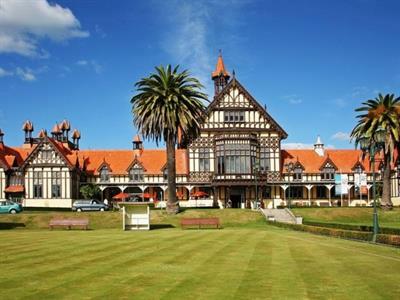 Here we can visit the carving school and see craftsmen fashion traditional wood carvings and watch the Maori women demonstrate flax weaving. 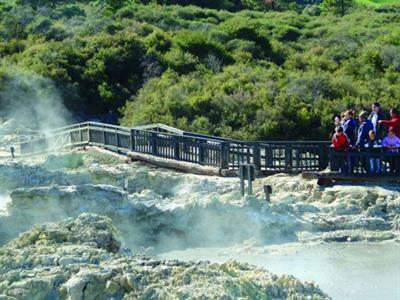 We take a short walk through the geothermal valley of Whakarewarewa to view the mud pools, the famous Pohutu Geyser and hot pools that make Te Puia such a unique destination. There is also chance to see New Zealand's iconic flightless bird, the Kiwi in a purpose built Kiwi-house. 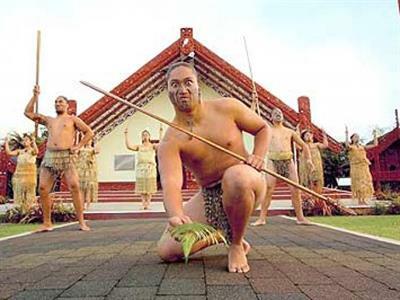 Our tour includes a Maori Cultural Performance on the Marae. Here you will be greeted onto the Marae grounds following the challenge by warriors before taking your seats for the concert inside the meeting house. You will see the traditional songs, dances and demonstrations of fighting skills [including the famous Haka]. We have time at Te Puia to enjoy lunch [choice of options, your cost] before we continue to the next destination, Hells Gate, which is a place of extreme contrasts, including the largest hot waterfall in the southern hemisphere. 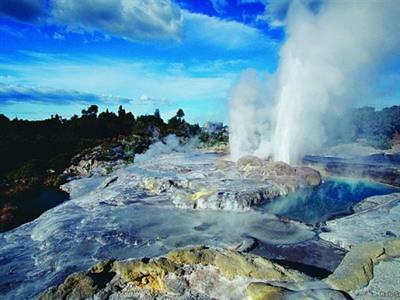 We will be able to see steaming fumaroles and pools of boiling mud as we stroll through this geothermal landscape. 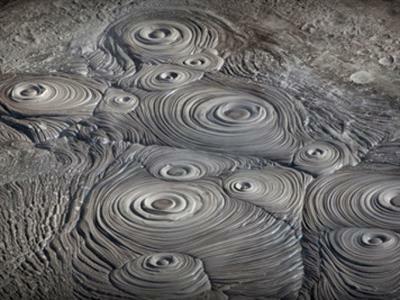 You do have the option to try mud bathing here, either as an alternative to the geothermal valley walk, or time permitting, as an additional activity. Extra charges will apply. Departing Hells Gate our drive back to the ship along the coastal route takes us past the extensive Kiwifruit orchards that are such an important aspect of the region’s economy. Our tour today concludes when your personal guide farewells you at the port gates in good time for the ships departure.